6volt electric fuel pump, 5-8 psi. You might want to add a fuel pressure regulator for some applications. USA made Carter 6volt electric fuel pump, 4-7 psi. You might want to add a fuel pressure regulator for some applications. 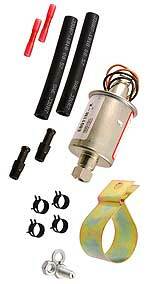 Replacement filter for our A-9349-6 or A-9349-12 fuel pumps (not for the A-9349-12-BR kit). This is a metal filter that has 1/8" male NTP threads on one end and 1/8" female NPT threads on the other end. When running fuel pumps on our vintage Ford's you normally need to reduce the fuel pressure. This regulator does the job. The knob on the face turns easily to adjust the fuel pressure from 1 to 5 lbs. This regulator has 1/8" female pipe threads in and out. Includes 3 pairs of brass hose barb fittings for 1/4", 5/16" and 3/8" rubber fuel line. Tank filler screen 1928-31. This screen goes in the tank where you fill it. It is actually a flame arrestor. (Due to tab width variations, you will have to bend the tabs in this once you get it). Use this handy tool, to remove the A-9020 filler screen from the fuel tank filler neck. 1928-29 Model A Ford chrome fuel cap. This screw style cap was only used for the 1928-29 Model A. The difference between it and the radiator cap is that this one is vented. 1930-31 Model A Ford fuel cap. This is a duplicate of the original Eaton style cap that fits! Polished stainless with the correct leather gasket. Bayonet style fitting. Fuel Filler Cap gasket for the 1930-31. When filling the gas tank, lay this down on the top of the tank to protect your nice shiny paint. Naugahyde with a soft lining. Made in USA. Special Speedo cable grommet for the 1928-29 Model A Ford. This elongated grommet fits in the hole in the tunnel under the 28-9 gas tank near the firewall. Speedo cable comes across the firewall, through this grommet, then up to the speedo. Made in USA. Sediment bulb repair kit 1928-31. Rebuild kit for the original firewall mounted cast iron sediment bulb. Made in USA. Glass Sediment bowl assembly for the 1928-31. The glass sediment bulb was actually in production from mid 1929 through 1931, but it will work on all Model A Fords. Sediment Bowl glass 1928-31. Replace that old stained sediment bowl glass with a nice clear new one! Note: Best to keep a spare! One of our customers dropped his, while at the side of the road. This is a corrigated fiber sediment bowl filter, to improve efficiency. Used only with the glass bowl style sediment filter. Neoprene is more durable than cork, but some customers have found that they swell when removed after prolonged use, so best to replace the seal, whenever you remove the glass bowl. Set consists of brass screen and gasket for the glass bulb type which was used from mid 1929 untill May 1931. Installation sequence is screen, gasket, then the glass. Set consists of brass screen and cork gasket for the glass bulb type which was used from mid 1929 untill May 1931. Installation sequence is screen, gasket, then the glass. Sediment Side bowl filter for the late 1931 Model A Ford with the indented firewall. This fuel filter was mounted directly to the side of the carb. You must have a late 1931 style carburetor to use this filter. Made in USA. Sediment Side filter bolt used on the late 1931 fuel filters that mounted on the side of the carb. This bolt is the special one that holds the filter to the carb. Made in USA. Late 1931 filter kit. Kit is designed to accommodate late 31 model A's with the gas valve on the firewall but NOT running the correct side-bowl style Zenith carb. Kit gives you a glass bowl type sediment bulb along with gas lines and fittings to install. Made in USA. Sediment Drain valve & spring 1931. For the late 31 style gas filter that mounted on the side of the carb. This is the drain needle and spring that screws into the bottom. Made in USA. Sediment Side-bowl rebuild kit for the late 1931 Model A Ford with the sediment bulb that was mounted to the side of the carb. Made in USA. Fuel shut-off valve for the 1928-31 model A. This is the valve inside the car that shuts the gas off going to the carb. 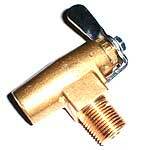 All brass valve made in the USA. Won't leak! Note: We recommend using an A-9193-T screen with this gas valve. 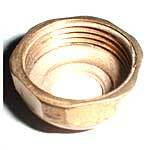 This style fuel shup off valve was used on the late 1931 Model A Ford with the indented firewall. Solid brass and guaranteed not to leak. Made in USA. Fuel tank screen 1928-31. This little screen presses into the gas shut-off valve where it goes into the gas tank. Prevents sucking gas off the bottom of the tank, and keeps junk out of gas lines. Made in USA. Fuel shut off Handle only for the 1928-31 Model A Ford fuel shut off valve. Made in USA. Fuel shut off valve grommet 1931. On the 31's that have the gas shut-off valve mounted on the firewall, you will need this grommet to go in the hole. This is an exact duplicate of the original. Made in USA. Sediment Drain needle housing for the 1928-30 Model A Ford. Made of brass as original. Goes in the bottom of the cast iron sediment bulb and the A-9177 threads into it. Made in USA. Sediment Drain needle for the 1928-30 Model A Ford. A brass needle with a forged knob just like the original. This is the drain needle for the cast iron firewall mounted sediment bulb. Made in USA. Early fuel valve handle as used from the beginning of production until April 1929. Made in USA. If your fuel shut off valve is leaking, you could try this before buying a repair kit or new valve. Fuel valve repair kit for the 1928-31 Model A. 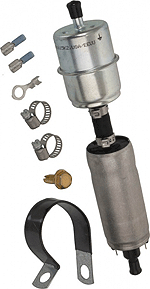 This kit includes packing, jam nut, lock washer, and special gas resistant lubricant. 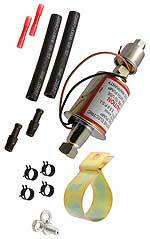 You will need this kit when rebuilding an original fuel shut off valve. Fuel valve pack nut as used on the original gas valves that were used from the beginning of production until late in 1929. Brass. Made in USA. Fuel valve pack nut for the 1929-31 Model A Ford. 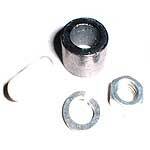 This is the nut that tightens down on the packing of the gas valve. Made in USA. Inside Fuel line for the 1928-29 Model A Ford. This line runs from the valve under the fuel tank to the sediment bowl on the firewall. Inside Fuel line for the 1930-31 Model A Ford. This is the later fuel line that runs from the valve under the fuel tank to the sediment bowl on the firewall. Fuel line for the 1928 to early 31 Model A Ford. Goes from sediment bulb on firewall down to the carb. This is a terne finish line with brass fittings. Not for the late 1931 Model A with the indented firewall. Fuel line for the late 1931 Model A Ford. This fuel line was used on the late 1931's with the indented firewall. 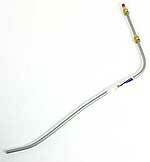 You must have the late 31 side bowl style carb to use this fuel line. Comes with fittings. This is the original style 9/16 head fuel line fittings that were used on the 1931 model A's and V8 cars. Made in USA. Fuel line fitting for the 1928-31 Model A. Brass gas like fittings like the originals. When you tighten it up, the ferrule will snap on the fitting. Made in USA. A set of special oversize brass ferrules to fit 1/4" fuel lines. Occasionally the seat of the sediment bowl or carburetor where the ferrule seats is worn or has been re-machined due to pitting. When these problems exist, the hex of the fuel line fitting bottoms out on the carburetor or sediment bowl before the ferrule tightens up on the fuel line when using conventional ferrules. These special ferrules will give you added length to compensate for that. Set of 2. 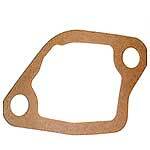 Made in U.S.A.
Fuel pump gasket for the 1932-34 Model B engine. If you are running a B engine in your model A, this is the gasket that goes between the fuel pump and the block. Made in USA. A complete rebuild kit for the 1932-34 model B fuel pump. Fuel pump diaphragm for the1932-34 model B fuel pump.. (Included in the B-9349-A fuel pump rebuild kit). Made in USA. Fuel tank retaining clamp for the 1928-29 Model A Ford. These are the clips that hold the bottom of the tank in place. The 1928-29 used 5 on each side. Fuel tank retaining clamp for the 1930-31 Model A Ford. These are the clips that hold the bottom of the tank in place. The 1930-31 used 2 on each side. This is a set of 10 hex head bolts with heavy hex jam nuts used for holding the gas tank clamps (A-35266-AR) together. Originally these bolts were a 3/8" headed bolt but unfortunately, they are not available. 12 volt electric fuel pump, 5-8 psi. You might want to add a fuel pressure regulator for some applications. USA made Carter 6 volt electric fuel pump, 2-4 psi.